Tennis court maintenance is inevitable, but fortunately acrylic hard court surfaces require very little time and effort to maintain. If your tennis court was properly built, per the guidelines of the American Sports Builders Association, the natural slope and weather will help to minimize accumulation of debris and water. 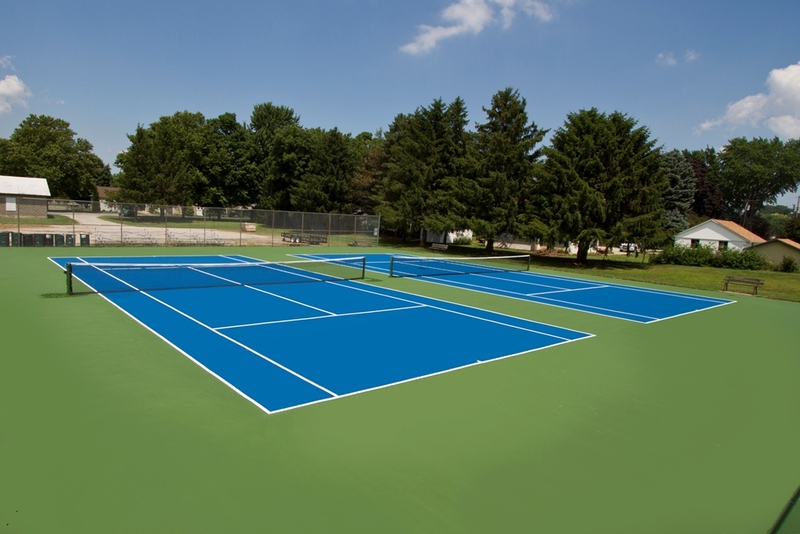 We will go over some other important tennis court maintenance items that you may want to consider, so that your court will provide many years of enjoyment. 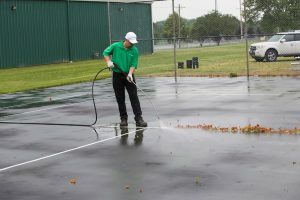 It is a good idea to clean your tennis court surface once each month. Most of the time, a blower and broom will do the trick. 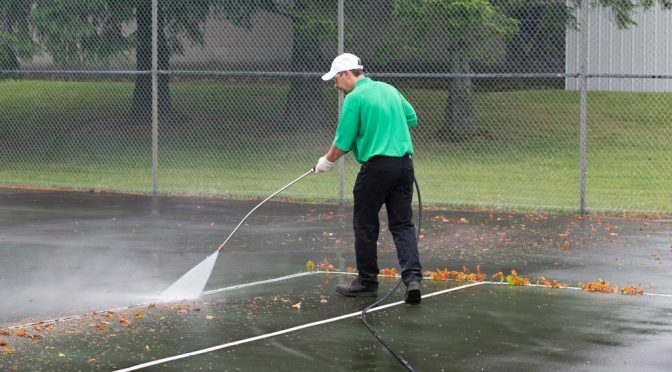 This will help to eliminate organic items like leaves, pine needles, and any other debris before it can stain your court surface or create friction under foot and contribute to premature wear of the tennis court surface coatings. Fill drum to the top with water and mix well. Spray or pour onto the tennis court surface and use a soft brush scrubber on desired areas. Pressure washing a tennis court is best avoided unless your are planning to have your court resurfaced. The tennis court cleaning solution, soft brush, and moderate pressure to rinse the court usually takes care of dingy surfaces. If you do decide to pressure wash your tennis court, be very careful and keep the PSI low to prevent damage to the color coatings. Water can be one of the most damaging enemies of tennis courts. Check from time to time to ensure that perimeter drains are not blocked by vegetation or plugged by other debris. Maintain vegetation or grass around the edge of the court to make sure it is not creating a dam that can inhibit positive flow of water, draining off the tennis court. Protect the surface from any chemicals, weed killers, or fertilizers that may be used around the court. Finally, make sure to have your tennis court maintained by a professional tennis court contractor, as needed. Tennis court crack repair, low spot removal, and tennis court resurfacing are important to the longevity of your asphalt or concrete base.